Research carried breadfruit that many intended to assure that this rice alternative foodstuffs true nutritional value commensurate with the nutritional value of rice. 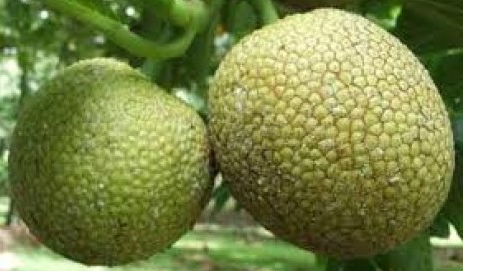 The advantages of the breadfruit tree is: can grow on land that rice can not be grown. Breadfruit is a perennial crop that can be harvested continuously and fruit throughout the year. Harvested breadfruit plants such as fruit growing on the tree twig. Breadfruit (Artocarpus communis) is an alternative food that is quite popular and is now beginning to be developed in various regions. Fresh breadfruit can be directly used as food, typically by way of frying flesh. In order to be kept longer as food, breadfruit breadfruit can be processed into dried cassava, breadfruit flour, starch breadfruit, or tapai breadfruit, etc.. Given these basic ingredients, the variety of snacks with raw materials breadfruit can be prepared and enjoyed at any time let alone a breadfruit tree can bear fruit throughout the year, so that the fruit can be harvested throughout the year. As a result of photosynthesis or photosynthate the main content of breadfruit is starch or carbohydrates are. However, breadfruit also contains proteins, fats, and vitamins B1, B2, vitamin C, and minerals (calcium, phosphorus, and iron). The water content in breadfruit is quite high, which is about 69.3%. Nutrient content breadfruit as follows. Young Breadfruit; Breadfruit Old, and the Flour Carbohydrates as follow: (g) 28.2 9.2 78.9 Fat (g) 0.7 0.3 0. Protein (g) 2.0 1.3 3.6 Vitamin B1 (mg) 0.12 0.12 0.34 Vitamin B2 (mg) 0.06 0.05 0.17 Vitamin C (mg) 21.00 17 4 7.6 Calcium (mg) 59 21 58.8 Phosphorus (mg) 46 59 165.2 Iron (mg) - - 0.4 1.1 Cassava is made from breadfruit breadfruit old has peeled clean, then cut into pieces. Breadfruit pieces are then sliced thinly. Breadfruit slices then spread on trays to dry in the sun. In order to process cassava drying breadfruit evenly and not easily contaminated by the fungus because of moisture, then every 3 hours should be reversed. During the dry season when the sun is really optimal drying can be carried out for 3 days. Cassava breadfruit can ditepungkan the ground in order to obtain breadfruit flour. Breadfruit flour derived from cassava processed breadfruit. Cassava dried breadfruit pounded and sieved with a fine sieve. Having obtained the refined flour and sun dried. Starch is made from breadfruit breadfruit old. Clean breadfruit peeled and cut into pieces and shredded or blended. To dissolve the flour and separating it from the pulp, add water to the grated breadfruit results. Filtering can be done repeatedly until all the starch is dissolved. Furthermore, let the starch settle by paying attention to the water layer at the top. The more clear water means the deposition, the better. After the deposition of water discharged, starch drying in the sun to dry. Dried breadfruit starch can be stored in plastic. Similarly, breadfruit nutrient content, so it can be categorized as a food ingredient that is very prospectively to be used as food substitute for rice.